And that was just the cut-outs. I also had a weakness for the lemon-pistachio drops…and the orange ricotta cookies. However, they never broke, and they were quite labor intensive, so I rarely swiped them. But the cookie I miss the most is the apricot almond thumbprint. It makes me remember my friend Ned, who was one of the major cookie elves and must have made a zillion of the suckers every year. It’s a pretty cookie, not too sweet, with interesting bits of almond to savor. Of course you can make it with any jam you like, but I have a weakness for apricot. This is not the original recipe, but it’s just as satisfying! Jack has a thing for chocolate chip, and I never turn those down. 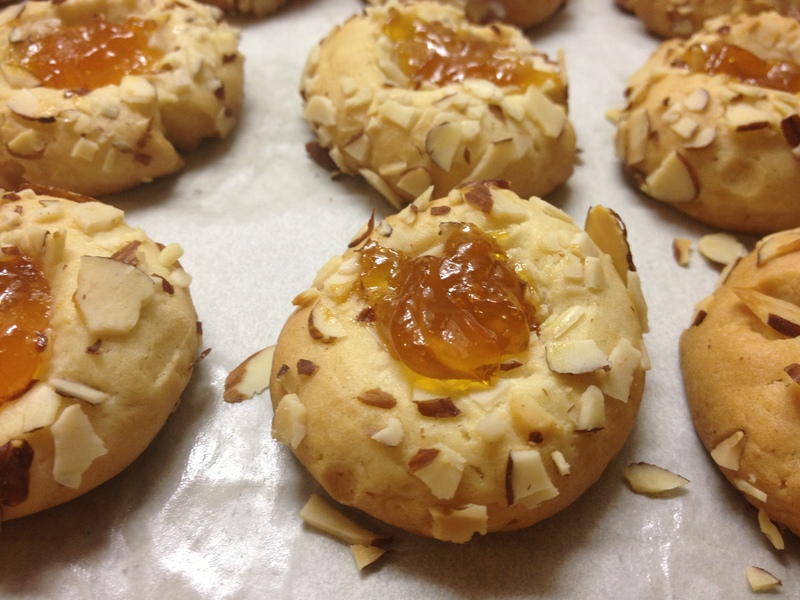 However, at holiday time I crave these apricot almonds thumbprints. After you taste one, you’ll know why. Enjoy! 2. Cover cookie sheets with parchment paper. 3. In a medium bowl, whisk dry ingredients. 4. In the bowl of an electric mixer on medium speed, beat butter and sugar until fluffy. Slowly add egg. 5. Beat in cream cheese, vanilla, and almond extract. Incorporate dry ingredients. 6. Shape the dough into one-inch balls with lightly greased hands. 7. Dip the tops in nuts. 8. Place, nut side up, on the baking sheet about 1 ½ inches apart. Using your thumb, press a deep well into the center of each cookie. 9. 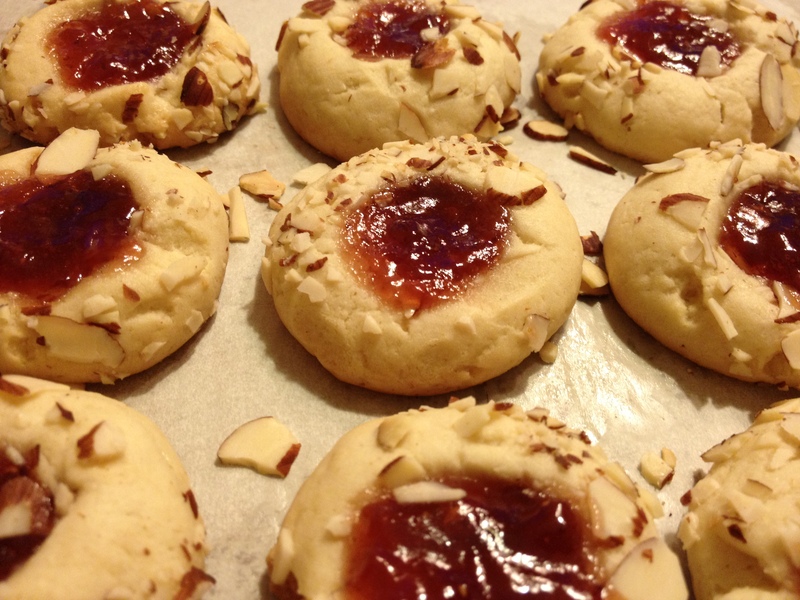 Place ¼ teaspoon of jam in each cookie. 10. Bake the cookies about nine minutes, reversing the trays front to back, top to bottom, halfway through the baking time. Bake until they just begin to brown around the edges. Transfer cookie to a wire rack to cool before sampling because that jam gets HOT! Why yes, I did make a batch just to take a picture for this blog post. Why yes, I did eat quite a few of them myself. Why yes, I have been thinking about my old job at that bakery all week. Isn’t it amazing how food evokes memories? That bakery was plumb crazy at Christmas time. We worked around the clock to get all those darn cut-outs frosted, all those Christmas cakes decorated, and those spectacular one-of-a-kind gingerbread houses finished. And don’t get me started on the wedding cakes. Or the employee cookie exchange, dubbed “The Joy Experience” by the evil elf cracking the cookie whip over those of us holiday-drunk enough to sign up.